National Two North’s leading pack will be taking nothing for granted in Round 20 after some surprising results last weekend. League leaders Hull Ionians lost to Wharfedale, while Chester (2nd) and Fylde (4th) also suffered defeats so this trio of promotion candidates will be keen to provide a reaction on Saturday. Whilst it may have been a disappointing weekend for some, the likes of Huddersfield and Hinckley were able strengthen their claim for a top two finish this season following victories over Leicester Lions and Stourbridge. This weekend, Field host Sheffield Tigers and Hinckley travel to South Leicester, while the aforementioned Hull Ionians, Chester and Fylde face Stourbridge, Peterborough Lions and Tynedale respectively. Elsewhere, sixth-placed Otley host relegation-threatened Macclesfield and Sedgley Park entertain Leicester Lions in the North-West. Just as it looked like normal service had been restored for Hull Ionians, their indifferent form struck again in Round 19. The National Two North leaders were beaten by the 14-men of Wharfedale, but following a weekend of shock results towards the top of the division, it means the I’s remain six points clear at the summit as January draws to a conclusion. The Yorkshire outfit end the month with a trip to Stourbridge and the hosts come into this fixture on the back of a narrow loss against Midlands rivals Hinckley. Stour’s inconsistencies have continued in January and they are currently lying in 10th place as a result of their patchy form. However, Neil Mitchell’s side have won their last two matches on their own patch and with Hull Ionians still not quite firing on all cylinders away from home, Stour might fancy their chances of becoming the fourth side to defeat the table toppers since the beginning of December. For the second time in just over a month, Chester failed to capitalise on Hull Ionians’ misfortune. Jan van Deventer’s side lost to Otley in the middle of December when the I’s were beaten by Leicester Lions and a similar pattern occurred last weekend. The league leaders suffered a defeat at Wharfedale while Chester were humbled by Tynedale meaning the men from Hare Lane are still six points off the top. One aspect that did go the way of the Cheshire side was a few of their promotion rivals also dropped points so Chester will be keen to bounce straight back when they entertain Peterborough Lions. The hosts have lost just once at home this term, but their visitors know all about beating Chester. The Lions may be rooted to the foot of National Two North and 20 points from safety, but one of their four victories this term did come against Saturday’s opponents back in October. Added to this, the men from Bretton Woods will also have a spring in their step after beating South Leicester last weekend so another victory in Round 20 would keep their faint hopes of survival alive. Huddersfield may not have had many better weekends than the one they experienced last Saturday. After battling to a fourth win on the trot against Leicester Lions, the news would have filtered through to the Field contingent that their fellow promotion candidates had dropped points in Round 19. Hull Ionians, Chester and Fylde all suffered defeats meaning Gareth Lewis’ side advanced up to third place in the National Two North standings. The Yorkshire club are just two points behind the play-off place and they also have a game, but first up is the visit of Sheffield Tigers. Field may well greet the Tigers with open arms as Jamie Broadley’s men were the side who defeated Fylde last week. After a few frustrating rounds of rugby, the men from Dore Moor picked up their first victory of 2019 and now they will be looking to build upon that result this weekend. The Tigers haven’t won on the road since the end of November so can they defeat another promotion contender to conclude January? Fylde’s nine-match unbeaten run came to end in Round 19 as Warren Spragg’s side were beaten by Sheffield Tigers away from home. 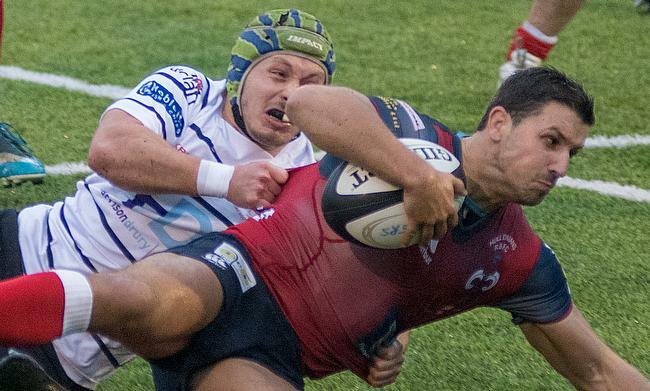 The Lancashire club were left incredibly frustrated as their lack of cutting edge meant they failed to take advantage of Hull Ionians and Chester both slipping up. However, the men from Woodlands are still only three points off the top two so they will be keen for a reaction when they host Tynedale in Round 19. But, by Fylde’s own admission, that is easier said than done. On the club’s Twitter feed this week, they labelled Tyne as their ‘bogey side’ having beaten the North-East outfit on just six occasions over the course of their last 17 meetings. Their most recent clash saw Tynedale run away with a 59-12 victory and the in-form visitors will be hoping for a similar outcome on Saturday. Ben Woods’ side will arrive at Woodlands having won their last three matches and with confidence seemingly high, Fylde’s ‘curse’ could well continue against Tyne. It is another Midlands derby for Hinckley this week after defeating Stourbridge last Saturday. The Hornets built on the positives from their narrow loss against Hull Ionians in Round 18 to maintain their unbeaten record at home this term. In addition to their victory over Stour, they also moved up to fifth place in the division and George Chuter’s men are just six points behind Chester as things stand. Hinckley are back on their travels for the third time this month and they will be keen to continue their improvements on the road when they take the short journey to South Leicester this weekend. The home side are currently in the bottom three and their survival bid suffered a major setback in Round 19 as they lost to rivals Peterborough Lions. South have picked up just two wins from their last 14 fixtures and sit 11 points from safety so a first home victory since the end of November would certainly be a welcome boost for the men from Welford Road. Last weekend, Otley’s excellent recent form hit a bump in the road as they came off second best against Preston Grasshoppers at Lightfoot Green. The Yorkshire outfit had begun the year with successive victories over Sedgley Park and Wharfedale which pushed them to the edge of the promotion picture, but defeat in Round 19 means Otley are 10 points off the top two. Charlie Maunder and Tom Casson’s men are not out of the promotion conversation just yet and those two aforementioned victories against Sedge and Dale both came at Cross Green, which is where they entertain Macclesfield this Saturday. The Blues arrive in Yorkshire 17 points adrift of safety following another narrow loss last weekend. Marshall Gadd’s side have produced some encouraging performances in January, but the results haven’t gone in their favour. As we approach the final third of the campaign, things don’t seem to be improving for Macc, but a win over Otley could be the platform they need to launch a survival bid. It was a topsy-turvy encounter with Macclesfield last weekend, but Sedgley Park came out on top as they secured back to back wins for the first time since the opening month of the season. Matt Bebbington’s side had targeted a strong start to 2019 and even though they lost to Otley immediately after the Christmas break, successive wins over Preston Grasshoppers and Macc would have injected some confidence into last year’s play-off runners-up. Sedge are back at Park Lane this Saturday where seven of their 10 wins have come this term so the challenge facing Leicester Lions will be a difficult one. In terms of the visitors, they suffered another close defeat against a promotion candidate last week. After losing to Fylde 14-13, the Lions were beaten 28-23 by Huddersfield in Round 19 which leaves Andy Key’s side 13th in the table. However, three straight wins over the festive period means Leicester have daylight between themselves and the relegation places so they will be keen to recapture their form as they look to end January on a positive note. Two sides who picked up excellent victories in Round 19 meet this weekend as Preston Grasshoppers host Wharfedale. Hoppers returned to winning ways with a bang last Saturday as they ended a three-game losing streak by beating Otley and the result also saw Paul Arnold’s men move back into the top half of the division. Whilst Preston were defeating Otley, Wharfedale claimed arguably the result of the weekend. After Ken Houghton received a red-card midway through the first half, the Greens produced a superb performance to pick up a victory against league leaders Hull Ionians at the Avenue. Like Preston, Dale had lost three matches on the bounce prior to last weekend so the result against the table toppers would have given Rob Baldwin and Jon Feeley’s side massive confidence heading into this fixture. Wharfedale also beat Hoppers 39-22 back in October so can the Yorkshire side defeat their Lancashire opponents once again?